Setup is for sissies. Flood wastes no time to get things moving, drowning a gloomy Scottish town even before the titles have hit the screen. Where many disaster movies spend the first half hour or more on heavy-handed exposition, Flood hits the ground running. We’ve seen New York and L.A. in ruins so many times by now that it’s kind of refreshing to see a European disaster movie for once. 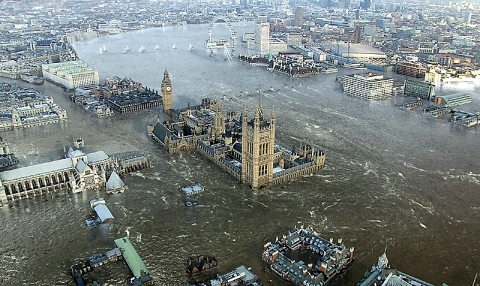 In Flood, London is the target, and as the title says, water is the means of its destruction. Robert Carlyle plays marine engineer Rob, who’s also a contractor handling technical maintenance of the Thames Barrier, designed to protect the city of London from flooding. His ex-wife Sam (Jessalyn Gilsig) is a manager at the Barrier. His scientist father (Tom Courtenay) is an expert on floods. Keep it in the family, eh? As a storm over the Atlantic causes a massive surge of water that heads up the Thames towards London, these three have to overcome old conflicts in order to save London and its citizens. The pre-title flooding isn’t the only sign that this is a movie that’s eager to get where it’s going. It also features the fastest father/son reconciliation I’ve seen in a disaster film: Rob blames his father’s obsession with work for the break-up of the family and also for the death of his mother. He vents his bitterness to Sam, ridiculing his father’s warnings about how a certain combination of factors may cause the Barrier to be overwhelmed by a massive flood. Then, just a few minutes later, Rob hears his father deliver the very same warning to the deputy prime minister (David Suchet), and instantly realizes his father was right all along. Maybe it was the way he said it. After that, it doesn’t come as much of a surprise when Rob wants to get back together with Sam a bit later in the film. Other Londoners are not as fortunate, as the flood indeed does overwhelm the Barrier and puts large areas of the city underwater. Rob and Sam escape from the Barrier and end up in the underground tunnels, where they meet other survivors and fight their way towards safety as the water rises. Meanwhile, the deputy prime minister and the police commissioner (the lovely Joanne Whalley), along with the military, try to evacuate London and save as many lives as possible. Apart from the setting there’s certainly nothing very original about this one, and as European disaster flicks are pretty thin on the ground, one might have hoped for something a bit more British and less Hollywood-formulaic in its approach. Still, the brisk pace and decent production values make it an acceptably entertaining contribution to the genre. It must be said, however, that the movie peaks too early, drowning London about 40 minutes in and then losing some of its momentum. Effects-wise it’s somewhat uneven, with some sequences looking a bit dodgy while other shots are very nice indeed. Especially the aerial views of the flooded city look good. As for the cast, they all turn in fine if not inspired performances, and it’s fun to see Nigel Planer (you may remember him as Neil the Hippie from 80’s britcom The Young Ones) as the world’s saddest meteorologist — every single forecast he makes turns out to be so disastrously wrong that he finally kills himself. Great review! Didn’t fancy it as much as you, but it definitly has it’s moments. You may wish to check out the 180 min mini series version as shown on ITV, has way more characters and plots, and quite a few more effects shots of London deluged. I thought this extended version outdid the feature film 107 min cut – more coherent and more plot issues resolved. And it makes a change to see this sort of movie set in the UK! the un cut version is well worth a watch. I didn’t know Tom Hardy was in this. He plays one of the Underground workers. Movie wasn’t bad, but they obviously cut out some subplots from the miniseries. Previous story It’s a Metal Tornado!